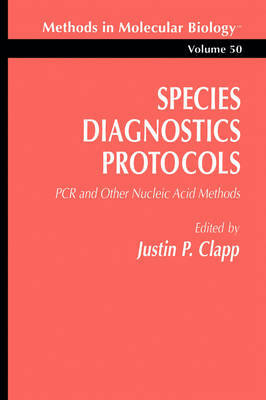 Species Diagnostics Protocols: PCR and Other Nucleic Acid Methods is premised on the rapid development in recent years of the use of nucleic acid-based technology for the identification of various organisms. The majority of applications have been in such medically related fields as the diagnosis of disease or the identification of dis- ease vectors, but this emphasis is changing as the potential and range of the techniques becomes more generally recognized. This has been especially true since the advent of polymerase chain reaction (PCR) technology. The use of nucleic acids for diagnostic purposes offers numerous advantages over conventional methods of identification. It must be stressed, however, that conventional methods are still extremely valuable and will always remain at the forefront of many diagnostic procedures. The ability of the skilled taxonomist begins to fail when there is a requirement to identify rapidly organisms that are small, immature, or present in large numbers. In such cases the time scale necessary to obtain an identification often precludes practical usage. It is in this context that molecular methods come into their own. There are several advantages that DNA can offer diagnostics other than the obvious and important fact that its base sequence is the fundamental source of biological variation. It offers a great amount of information that is not accessible to other methods of identifica- tion because the vast majority of DNA is not expressed.